I'll go sentimental route today and mention a rare find among lobby cards, one I nearly failed to note, as who regards the "verso" of such a collectible where imagery is on the front side? Serious gatherers are as scrupulous to the back, for often it is tip-off to damage and/or restoration effort having been made. Rest assured that lobby cards are a sought-after modern art, many of us hooked on them from early age. 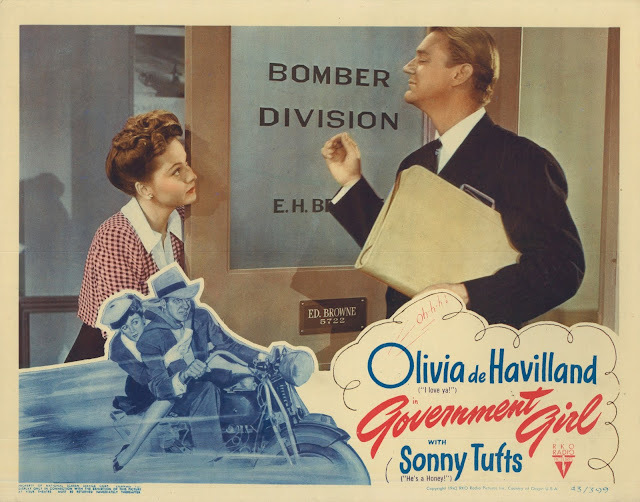 This sample was response to my liking Government Girl, a Washington-based comedy with Olivia De Havilland and Sonny Tufts. Presumably funny in 1943, it is dated now as meat rationing and black market tires (GPS dealt with GG in July 2010). What moves me about the card is what a long-ago someone wrote on its flip side: "Note --- This lobby is in memory of my beloved Aunt Evelyn, when we saw this film at Warner's Hollywood Theatre, Hollywood Blvd., Calif." A number of the words are underlined, as here was precious memory for whoever wrote the inscription. 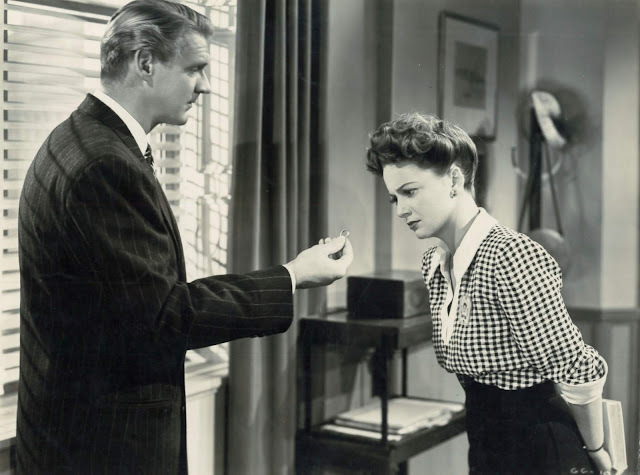 Unusual was someone getting a lobby card for a keepsake --- these weren't supposed to be given or sold to patrons. Was Aunt Evelyn and her niece, or nephew, members of an exhibiting family? A Government Girl lobby card might otherwise have been tough to come by as those black market tires. I'm convinced that most stars had little idea of what they meant to their public. Olivia De Havilland no doubt figured Government Girl for a slight vehicle, but what would she say then (let alone now, at age 102!) to such expression as this on the part of anonymous fans who memorialized their evening out to see a film so few are around to remember first-hand? Joan Crawford once said that screen players have less way of knowing what they mean to an audience because, unlike stage performers, they don't get immediate gratification of applause, being stood before cameras and an indifferent crew. Short of going out among viewership, and interaction with them (Crawford certainly did that), how would film players truly know their value? It has been said that small towns were the last to forget a star, but how many stars ventured to small towns? I'm betting most from the Classic Era lived and died without realizing half their importance to an anonymous multitude who bought tickets and revered their work. The truly mass audience then was a thing almost beyond calculation now. "Stars" today scarcely warrant the name compared with what used to be. Never mind your TCM broadcast or Warner Archive disc, and imagine Government Girl at the Warner's Hollywood with 2,350 seats and as many laughing in them. Government Girl might have seemed like the funniest picture ever made in such an environment. I wonder how long this lobby card stayed in the family before they forgot Government Girl, Aunt Evelyn, and the reason why the outing meant so much. Such tribute for me turns an attractive representation of an obscure film into meaningful proof of what moviegoing once was to its public. What a nice piece, John. Thank you. Reminds me in a small way how movies in the classic era were such an emotionally unifying force in America. Is there a film today that would, could, evoke a similar sentiment? Ditto what Dan said! This really humanizes the wartime movie goer. My wife & I are friends with a woman who saved a bunch of Christmas cards her mother received in the early 1930s. In one of them, the sender recounts that she had just seen Wheeler & Woolsey's "Cracked Nuts", and how funny it was. That kind of direct connection to a movie's original release is almost chilling to me. A few weeks later, the woman & her husband dropped by for dinner and to watch my copy of "Cracked Nuts". It didn't go over as well with a contemporary audience, I'm afraid. As a hospital worker in Texas, I once took care of Ronnie Lane, bass player for the Small Faces and The Faces. I told his personal assistant that I had records by both bands and he implored me to ask Lane for his autograph. He said, "Ronnie thinks nobody knows who he is here in Texas". When I spoke to Mr. Lane he was thrilled that I knew who he was and could name many records he played on. My mother recalled when she was a young nurse -- a little after the war, I think -- Eddie Bracken made some kind of appearance at her hospital. While chatting with a group of nurses, he made a few charming remarks to her ... and got a huge laugh by handing back her wristwatch, which he'd removed while she hung on his words. I suspect that was a frequent gag for Mr. Bracken. 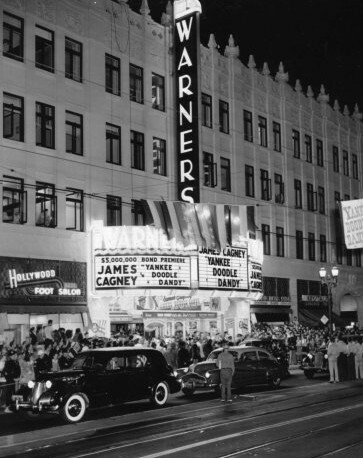 As for the Warner Theater, at some point--you would likely know better than I--it was retrofitted as possibly the first L.A. area Cinerama venue. 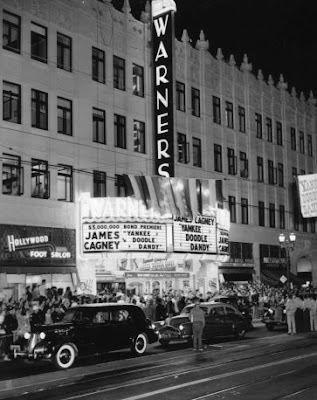 From that point forward it was also called the Warner Cinerama Theater. Obviously the entire movie industry was holding their breaths but betting on any number of things and that was one of them. Whereas I did NOT see a movie made in the Cinerama process at the Warner, I DID see a movie that was touted as a Cinerama production there. I'm holding the title in abeyance because many may not ever have known this. Today, any affiliation with Cinerama is, I think, long since forgotten. Okay! It was Stanley Kubrick's immortal "2001: A Space Odyssey"! And, about as much a Cinerama production as Stanley Kramer's similarly-touted "It's a Mad, Mad, Mad, Mad World" which had preceded it. However, I can testify as a reserved seat ticket holder that the impact of that remarkable, austere movie was almost instantly unforgettable. The sweep of the screen, the strange and stirring classical potpourri soundtrack, the unprecedented imagery and almost maddening mysticism of the film were amazing. And I can say that the interior of the theater was vast, the seats luxurious, and all the seats had a good view. The lobby was still on the old school side, and magnificent in the impression it gave you. I seem to recall that instead of the inevitable 'refreshment' counter running across as you entered, it was on the side, and the theater was entered along the opposite side. This was not uncommon, either. I also dimly remember a tribute to Harry Warner and his photo on the wall. That was some evening. When I think of it, you'll pardon the cliche that escapes my lips: it seems like yesterday. And, so it was! Plus a little more than fifty years added on. But there were many grand evenings in these amazing theaters. I can't say I saw all the great ones...the actual theaters, I mean. The famous Fox Theater in San Francisco was certainly among the very greatest and only exists in photos as the movement to protect such structures as historical spaces had not yet been launched before it was condemned to the wrecking ball, and I would surmise that whatever took its place in the '60s would probably not be worthy of the now existing protection such special structures later benefited from. The ironies of life. Many others have simply died because they lived beyond their time. I've mentioned before that the Fox chain had a rather grand and impressive theater in Redondo Beach, right near the ocean and steps away from the surviving Redondo Pier amusement/restaurant attraction there. I remember going there a couple of times, but age and the dwindling ticket sales had already condemned the poor place to a tatty state with some rather unpleasant smells inside mostly composed of mustiness from the sea air. The most amazing and real element was a much weathered but still legible painted sign on the back of the building that proclaimed that "TALKING PICTURES!" were being exhibited there. I could kick myself for never bothering to take a picture of this! The Fox Redondo was knocked down many years ago in the early '70s and replaced with a senior living complex. It's one thing to tell a young person how people revered movies, how novel they were, how varied, how magical, how almost essential they became to their lives. It's another to have just managed to catch this impression before it changed, forever. I'm glad however that people still enjoy going to see movies, even if for me they lack that heady quality, that thrill of the theater and make-believe that they once communicated so richly.